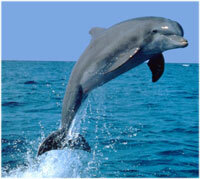 The dolphin is one of the most playful, intelligent and beautiful creatures to grace our planets oceans. Any decorating theme that involves dolphins should take all these aspects into account. Dolphins are playful creatures so your decorating theme needs to reflect this playfulness and also include a dolphins natural environment - the ocean. Firstly let's look at the colours you might want to use. Obvious ones are whites and pale blues to give that watery feel to the room. Don't overdo it with stark blue finishes in the room as it can make it feel very cold. The ocean itself has more than one color to it. There's pale greens and aquamarines there too. Make full use of these in the room to prevent that cold feeling creeping up on you. One idea is to have a white ceiling which graduates to the top of a pale blue wall with a crashing white wave effect which could be achieved quite easily with a small brush and some effort. Wall murals are another way of instantly adding to your dolphin decorating theme. You could go with deep blue murals on a pale background or the opposite with pale blue murals on a dark blue background. The size of the mural will be down to personal preference but be careful not to make your walls too 'busy' by adding dolphin murals everywhere. Something else I found online were dolphin tables by a company called San Pacific. These pieces are truly stunning and are a definite conversation piece for any room. Remarkable pieces of work. What else can you use in your theme? Well how about soft blue cloth table covers in the room. You also create or buy some furniture slip covers in a pale blue and cover them with throw cushions in a variety of ocean colors. Last not least add a few dolphin figurines to the room. Again do this tastefully - overuse of figurines can make any room, regardless of size, feel very crowded and messy.